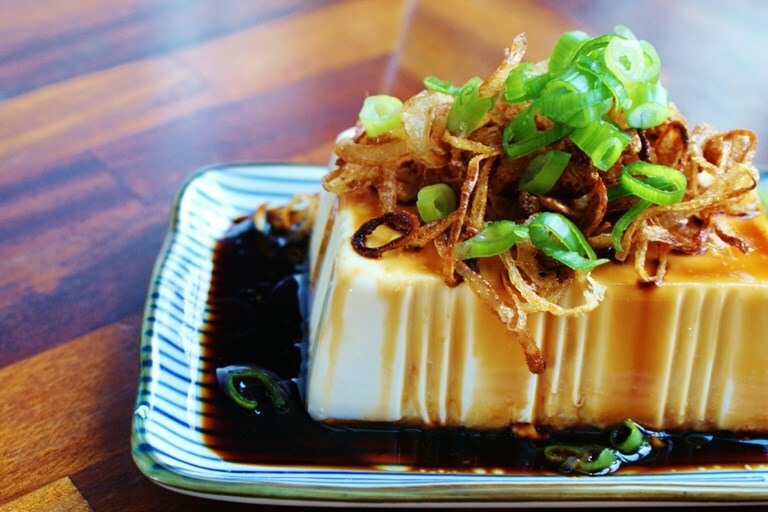 Malaysian-Chinese blogger Hungry Female shares her delicious recipe for chilled silken tofu with crunchy shallots, and explains why tofu should be elevated to a dish in its own right, and not just used as a meat substitute. Take a look at our ingredient focus to learn more about the many forms of tofu. In the UK, tofu or soya bean curd is often seen as a substitute for meat, finding its way into burgers, salads and even English-style breakfasts as a token vegetarian option. Whilst I am genuinely intrigued to see how tofu is used in the West and am pleased it has found its way into mainstream eating culture, this is far from how the Chinese view and treat it. I love tofu. Firm and silken are only two of the many forms and textures that this white soya bean product comes in. Tofu produces a delicate yet crunchy outer layer when fried. Tofu skin can be kept and dried becoming rippled and slightly chewy. This type of tofu is wonderful when tossed with meat and vegetables. Tofu puffs (deep-fried tofu with a puffy pillowy texture) can be stuffed with almost any ingredient to make a small sandwich that looks similar to a Momofuku bun. Tofu can also be eaten sweet – tofu flower is a widespread Southern Chinese dessert made from very silken tofu that has been chilled and drizzled with sugary ginger syrup or molasses. The Chinese honour tofu in its own right, never as a substitute. Being a ‘yin’ or ‘cooling’ ingredient (Yin as in Yin and Yang, the Chinese concept of duality and balance) it is used to counter heavier, richer foods in a meal. Tofu is a canvas for almost any flavour, a typical Chinese menu would feature tofu as a key component alongside meat, vegetables and seafood. If you would like to try tofu in a typical Chinese way, try making chilled tofu with crunchy shallows – one of my favourite tofu recipes that I have enjoyed since I was a child. Silken tofu is regarded as a higher grade tofu and is best eaten chilled. The crunchy shallots create a crisp, sweet contrast to the milky, smooth goodness below. Hungry Female is a Malaysian-Chinese blogger passionate about all things foodie but especially the food of her heritage, Chinese.